Adobe on Monday introduced Lightroom Mobile for iPad, a touch-friendly accompaniment to the company's suite of photography software that brings powerful new tools to Apple's iOS, including on-the-go RAW image editing. The app, which is available now from the iOS App Store, offers those invested in Adobe's ecosystem a new way to sync and organize images within their existing Adobe ecosystem. More impressive, however, is the app's built-in RAW image editing functions. With Lightroom mobile for iPad, Adobe has essentially enabled tablets to edit large RAW image files remotely. This not only adds a new dimension to photographers' workflows, but untethers them from their desktops and laptops. The process uses Adobe's Smart Previews technology. Lightroom 5 on Mac or PC generates a DNG image from RAW image data and syncs the the file with Lightroom mobile. Users can edit this smaller file on the iPad with Lightroom's usual RAW toolset, then sync the changes back to the desktop version when finished. Edits and any changes are seamlessly applied to the higher-resolution RAW file. Modifications made to the portable file are logged and carried over to the original image in an editing history so photographers can have granular control over past edits. In-app organization filters are also powerful and include file name, image capture time and image modification time, among others. Aside from Lightroom 5 for Mac and PC, the app can also pull from an iPad's camera roll, directly from DSLR cameras and images stored in the cloud. 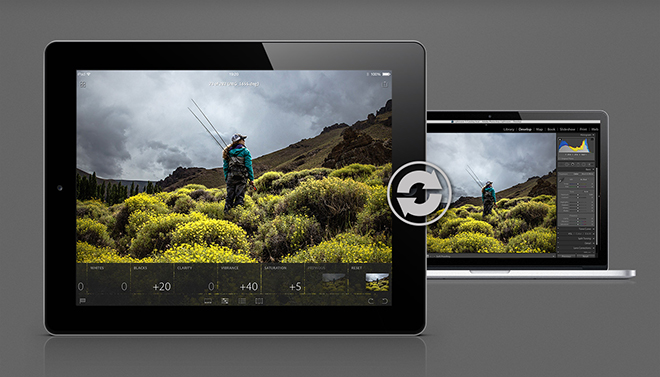 Sharing is also made easy with hooks in Lightroom.Adobe.com and popular social networks like Facebook and Twitter. In order to function, users need to have access to Lightroom 5 on a desktop or laptop, Lightroom's mobile service and Lightroom mobile for iPad. This means owners of non-Creative Cloud Photoshop or Lightroom will need to buy a subscription to a qualifying Adobe Creative Cloud product. Finally, Adobe says an iPhone version is in the works, but did not provide an estimated release date. Import images from your iPhone or iPad camera roll straight into your Lightroom catalog. Enhance them using familiar and powerful Lightroom tools. Share them online quickly and easily. Adobe is currently offering a 30-day free trial for Lightroom mobile as well as a limited time special on the Photoshop Photography Program mentioned above, which includes Photoshop CC, Lightroom desktop, mobile and web, 20GB of cloud storage and a Behance ProSite for $9.99 per month.